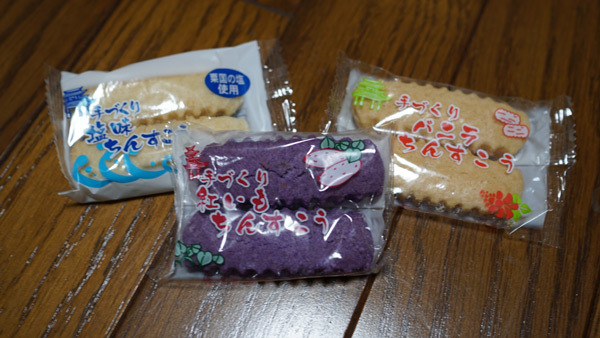 Chinsuko are Okinawan baked sweets that have been made here since the day of the Ryukyu Kingdom. Their traditional main ingredients are flour, sugar and lard. “Chin” has two meanings, “rare” and “gold” while “sukou” is “snack” in Okinawan dialect. In the days of the Ryukyu Kingdom, only aristocracy ate chinsuko. It has a texture like a biscuit, and they are not very sweet. Today, chinsuko are as popular as ever, and they area real Okinawan survivor. In 1996, Fashion Candy, a company that makes and sells baked goods in Ginowan, created Chinsuko with a chocolate coating. Since then, other companies have created chinsuko with a variety of flavors, such as cheese, sweet potato, pineapple and salt. Traditional chinsuko are shaped long and thin. However, these days one can find round, flower and even Shisa shaped chinsuko on sale at souvenir shops throughout Okinawa.